Standing in downtown Wheeling, “the original gate to the West” (as Wheelonians sometimes call it), it’s hard to throw a stone without hitting something historically significant. That is especially true at 1413 Eoff Street, the First State Capitol Building (constructed in 1858). The state’s first capitol building is being restored to its 20th century glory, and also being brought into the 21st century. Cassidy is a history buff—especially when it comes to his building, of course. He and his wife Mary Ellen bought the property in 1993. Today, in addition to housing the Cassidy, Cogan, Shapell & Voegelin law firm, it’s also home to several small businesses and organizations as well as West Virginia Public Broadcasting’s northern news bureau, and the Wheeling Academy of Law and Science, or the WALS Foundation. “It’s mainly an educational foundation that has classes for lawyers and also other professionals in the area,” Patrick Cassidy said. The Cassidys established the non-profit corporation in 2004 to promote educational programming and consulting in the areas of education, employment, energy, and the environment; and also to promote local economic opportunity, employment, and job creation in Wheeling and the state. 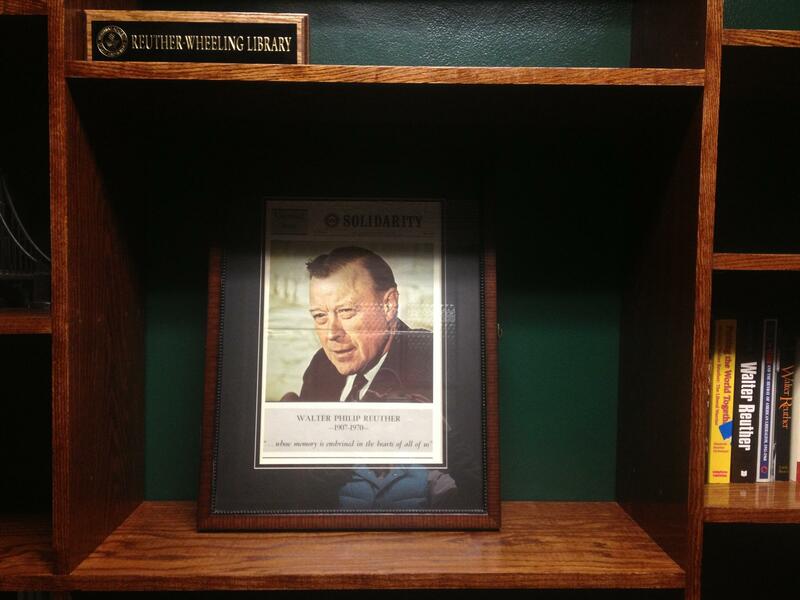 Today the foundation is also developing The Reuther-Wheeling Library and Employment Policy Research Initiative which, in addition to providing educational programs, forums, and research opportunities, is also developing a library dedicated to Wheeling’s famous mid-20th century union leader Walter Reuther. Solar panels were installed on the garage attached to the First State Capitol Building by an Ohio-based company, AAT Solar. 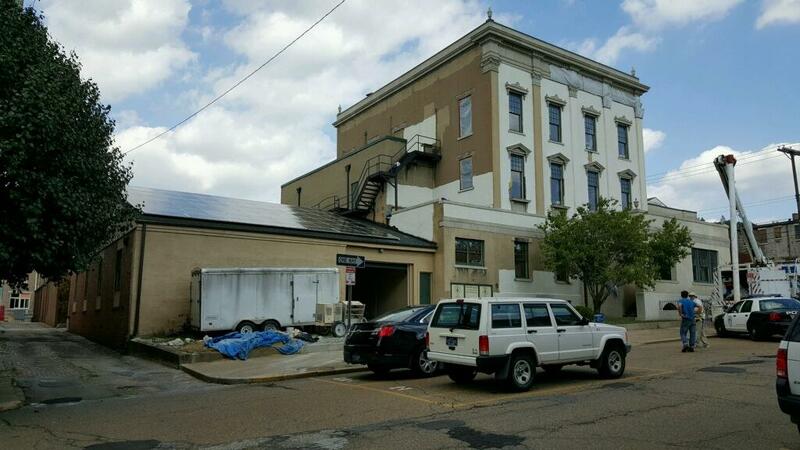 The company was awarded a bid for the Wheeling Solar Co-op and is currently installing panels on homes and businesses throughout the area. While the WALS Foundation has been developing inside the capitol building, the Cassidys have continued to restore the property, culminating in final restorations outside. Bucket trucks and lifts carry restoration professionals who are mixing and applying fresh coats of white plaster cement. They’re restoring the exterior of the building to the stucco, colonial-style finish that was so popular in the ‘20s. “We’re bringing it back to probably how it looked in the 1920s when it was used as a mortuary,” explained Patrick Cassidy. But the changes outside aren’t entirely dedicated to historical preservation. There’s an addition to the building, a garage, which was just covered in solar panels making the First State Capitol Building the first solarized building in downtown Wheeling. Lifelong science educator and scientist, Mary Ellen Cassidy is a passionate proponent for developing renewable energy sources in West Virginia. But it was a personal incentive that got the solar ball rolling at the capitol building. “Our 45th wedding anniversary was coming up. We decided that [solar panels] would make the best anniversary gift ever. It truly was the best anniversary gift ever,” Mary Ellen said laughing. “It’s a gift for both of us because we both benefit from it,” Patrick interjected. Patrick and Mary Ellen Cassidy say they feel strong moral obligations to not only reduce their carbon footprints but also to stimulate the economic viability of renewable energy sources and jobs that support them in West Virginia. They say old buildings here are capable of being highly efficient, modern structures. This weekend, on Sunday November 15 from 2pm – 3:30pm, the First State Capitol will be hosting a “solar celebration.” The event is open to the public and will showcase various solar initiatives in the Ohio Valley. On West Virginia Morning, a survivor of the attack on Pearl Harbor spoke to members of the Morgantown High School band. The band has been chosen to represent the state at commemoration ceremonies in Hawaii next year. And we’ll visit West Virginia first state capitol in Wheeling. Solar coops in Wheeling and Morgantown are looking for proposals from solar companies to install panels on their homes. Residents in Wheeling and Morgantown are banding together to buy solar panels in bulk discounts for their homes and businesses. So far there have been 73 sign ups into the Wheeling coop and 86 in Morgantown. Ben Delman from the organization that is facilitating the coops, Community Power Network, reports that of those interested, about 24 homes in Wheeling and 50 in Morgantown are suitable for solar panels. Both co-ops will be open to new members through the summer. Cooperatives aimed at reducing the costs of residential solar arrays are sprouting up around West Virginia. The Charleston Gazette says the nonprofit WV Sun has helped form co-ops in the city of Charleston and Fayette and Monroe counties. Similar collectives are beginning to take shape in Wheeling and Morgantown.